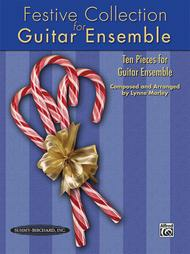 Ten Pieces for Guitar Ensemble. Composed by Lynne Morley. Guitar (Suzuki); Suzuki. Christmas. Collection. 64 pages. Alfred Music #00-27991. Published by Alfred Music (AP.27991). 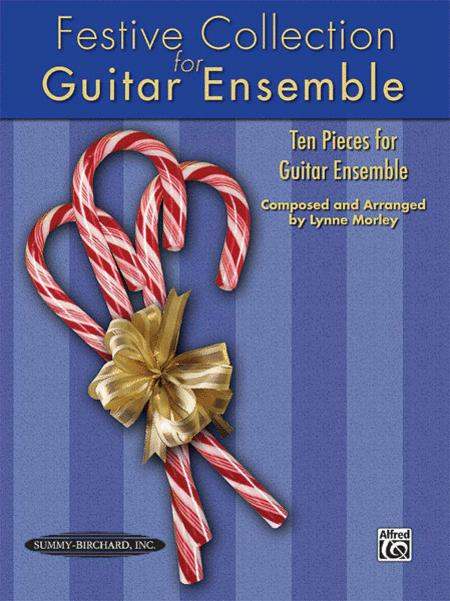 Festive Collection for Guitar Ensemble contains arrangements and original compositions for guitarists of various skill levels, from the complete beginner to grade 3 and beyond. The books contain a varied repertoire that students will enjoy playing as a group. Each arrangement has a part for beginning, intermediate, and advanced students. Generally, the more advanced students take the melody, while less experienced students play the accompaniment. When provided, the chords can be strummed by a teacher or student familiar with playing folk styles. For beginners, the chords can also be simplified to just the bass notes. Titles: Schiarazula (Anon) * Patapan (Traditional Carol) * Cornish Carol (Traditional Carol) * Gaelic Carol (Traditional Scottish Carol) * Allemand and Tripla (Widmann) * Fanfare and Dance (Lynne Morley) * Don Oiche ud imBeithil (Traditional Irish Carol) * Gaudete (Traditional English Carol) * St. Anthony Chorale (Haydn/Brahms) * Auld Lang Syne (Traditional Scottish Tune).